When is the best time to aerate your lawn? If your lawn is looking patchy and worn due to a heavy amount of foot traffic, this would be a good time to aerate your lawn. Because core plug aeration requires a heavy machine, it is recommend to hire a professional for lawn aeration service. Lawn aeration is not like using a lawn mower and requires a steady hand and knowledge of the equipment. The best time to aerate your lawn varies depending upon the type of soil and grass you have. Clay soils should be aerated twice a year. Once in the spring and again in the fall. Sandy soil should be aerated once a year, either in the spring or the fall. For warm season grasses, like those you find in Texas, you should aerate in the late spring or early summer. Cold season grasses should be aerated in late summer or early fall. A lawn aerator is used to dig up and open small holes in the soil so that air and water can get down to the soils that would obstructed with compacted soil. 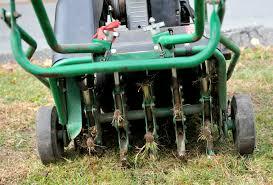 Aeration can help your lawn get stronger by growing deeper roots, thus your grass gets longer. Here are some lawn care tips on how to core aerate your lawn. First and foremost, make sure the soil is moist enough. Core aerating dry soils is time consuming and adds more work to the task. Aerating the day after a rain shower or watering your lawn the day before is advised. Aeration machines cover only a small percentage of soil surface per pass. Making multiple passes over the most compacted areas is recommended. Two options for excavated plugs: 1.) Water after aeration and soak the plugs allowing them to break down into soil. 2.) The excavated soil plugs should be allowed to dry and then broken up to give your lawn a uniform, clean appearance. Break them up by running them over with a lawn mower or pounding them out with the back of a rake. 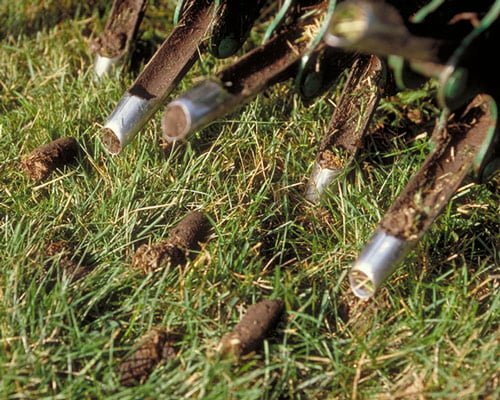 If parts of your lawn are growing well, you should not aerate as often. Often at times there might be big areas of your lawn that is unaffected by compacted soils, clay soils, or even heavy thatch build up. Had no idea how an aerator works but now I feel I know a bit more. Will do more research on this and maybe watch a video and then I will try to do this myself. Hope I do a good job ;).